2017 application for Certificate in Sports Studies is now open! 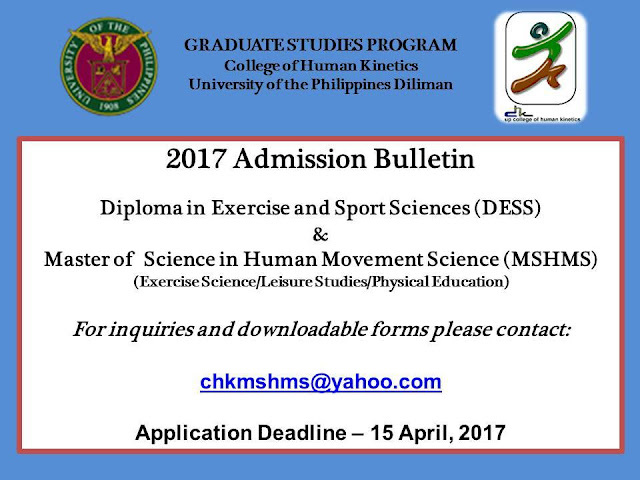 The UP Diliman College of Human Kinetics is now accepting applicants for its Certificate in Sports Studies Program. This round of application only accepts new high school graduates with UPCAT grades of at least 2.800. Applicants with UPCAT grade below 2.800 will not be accepted. Total of P500.00 to e paid to Ms. Klem dela Peña, 2nd Floor, CHK Administration Main Office. Pleae show UPCAT results before payment. 2017 applications for Diploma and Master of Science programs are now open! Kinetika by UP CHK, formerly known as the UP CHK Community Recreation Program, has launched its 2017 Summer Camp programs and schedule. For more information, check out their Facebook page, contact 09564190607, or email kinetikachk.upd@up.edu.ph.